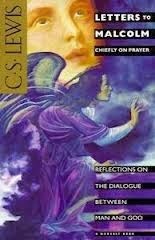 SEASONS, my women reading theology group, selected Letters to Malcolm, Chiefly on Prayer by C. S. Lewis. I had the book on my shelf, highlighted from two previous readings and put off rereading until this week. I was in for a bit of a shock. Lewis and his imaginary friend Malcolm--an undergraduate with C.S. Lewis, exchanging “interminable letters on the Republic and classical metres, and what was then the “new” psychology!” and now continuing their correspondence on the subject of prayer--are far better read than I. Lewis drops a lot of names and builds his sentences of countless literary references. Many of the people he mentions are intellectuals, philosophers, believers who wrestle with God or fight against “religion” as idolatry. While I recognized most of the names, I was not as familiar with their thought as I needed to be to fully comprehend Lewis's dialog. I think Lewis intended this book not only as a treatise on prayer but also as a dialogue with his contemporary theologians on the issues of the day. In particular Letters to Malcolm addresses Alec Vidler’s Soundings and Bishop of Woolwich John Robinson’s Honest to God. I began making notes in the margin of my book. Then I decided to create a cheat sheet to share with SEASONS. I worked through the first six chapters. Then I found that someone else had already done so. Wasted effort? No! I have decided that I might want to read Pascal. I discovered a woman novelist, Rose Macauley, to see if I want to read; since she's 20th Century it may be a long well before she climbs to the top of the book stack. Simone Wiel looks very interesting. This link is to a chapter-by-chapter listing of notes by Arend Smildes which I think the reader will find helpful. "For it is in making himself nothing, in his utter self-surrender to others in love, that [Jesus] discloses and lays bare the Ground of man's being as Love". "For assertions about God are in the last analysis assertions about Love". "We are all sure that there is a way ahead, else we should not have taken up our pens. We have been less disconcerted by our differences than surprised by our concurrencies." "The Bible," we are told sometimes, "gives us such a beautiful picture of what we should be." Nonsense! It gives us no picture at all. It reveals to us a fact: it tells us what we really are; it says, This is the form in which God created you, to which He has restored you; this is the work which the Eternal Son, the God of Truth and Love, is continually carrying on within you. As mentioned in my last post, I have been adding a number of things that belong to my husband's family to our household. His dear mother, Betty, has downsized into an assisted living apartment. I've been working my way through a stack of linens and was delighted to discover a beautiful tablecloth that is so wonderful that my enthusiasm is undiminished. Even after a week of working on a stain--gone! Even having spent the greater part of a day at the ironing board. My friend, Bobbie H., asked if the tablecloth had "a history." Today (Valentine's Day) DMP and I took his mother out to lunch and I asked her about the tablecloth. In the Spring of 1957 the family went on a cruise from Puerto Rico--where they were stationed while Charles was flying SAC missions out of Ramey AFB and where Bryan was born--to Panama. Nine-year-old David learned to play chess during that cruise. Betty bought the tablecloth in Panama. She said, "The Army/Navy tablecloths had been around a long time but they finally made one for the Air Force. I'm sure it was made in China as most were then." Detail of the octagonal panel embroidery and cut work. "China" in this context denotes Taiwan, the source of high quality linens in the mid-20th Century. Betty's cloth is all high end textile, no polyester, and appears to me to be hand sewn. Similar antique and vintage tablecloths are usually called "Army/Navy" cloths. They are typically composed of alternating square panels of embroidered and cutwork linen and hand made filet lace, bordered in filet lace. All hand made of natural linen/cotton and stitched together by hand, it is a tour de force of textile art. Examples have been found dating back to the Civil War. Some sources say it was the style of tablecloth used in the Army Navy Club in Washington, D.C.
My guess is that the octagonal shape is what distinguishes the Air Force cloth from the Army/Navy cloth. A half-octagon is the rather stylized wing of the current USAF logo. That logo was not adopted until 1970 but the bottom section of the USAF shield is that a half octagon. The lower section of the Army shield is almost square; the Navy's, triangular. Note also the repeated ^ ^^ shapes in the cut work and the filet lace which might also be a wing motif. 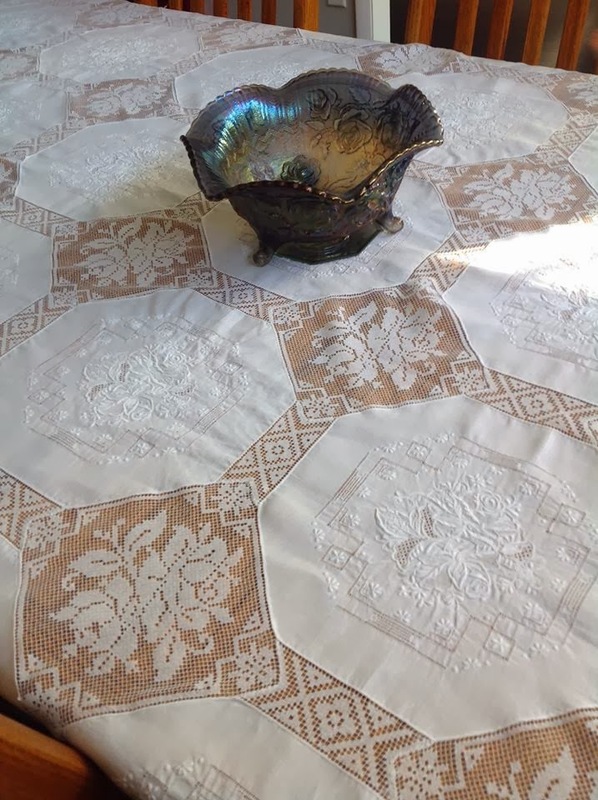 I especially like the rose embroidery and lace panel because it goes so perfectly with the Open Rose footed fruit bowl (Imperial Glass) which my mother bought in the late1970s from the old back room inventory when Brown's (or was it Baker's?) Store in Lockney went out of business. I always keep a mirror under the bowl to reflect the light. 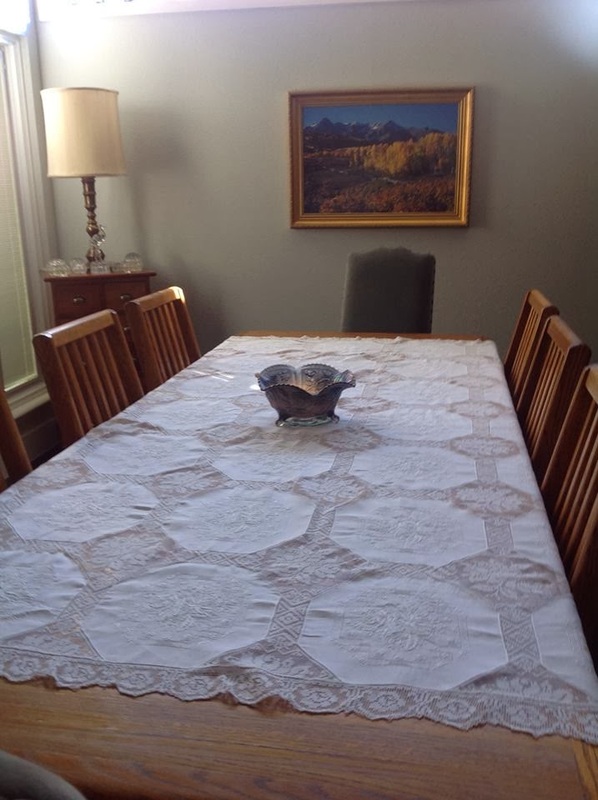 I love my table where friends and family gather but I do not ever plan to use this particular tablecloth during a meal. It is truly vintage collectible, now at least 57 years old. Also, I am not eager to wash and iron it anytime soon. Moving empties all the closets. Bits and pieces packed carefully away are unpacked, looked at, shared with others, displayed, repacked, or discarded. Theoretically, skeletons may walk about. My mother-in-law, Betty Meggs Pipes, recently moved from the large family home into a much smaller assisted living apartment. These are a few treasures that have found a new home with David and me. The pottery we bought for David's mother, mostly in the late 1970s and 1980s during our vacations in NW New Mexico and SW Colorado, have moved from Betty's bookshelf to our entry. the first piece we bought by the great Santanita Suazo, mother of Candeleria Suazo and Mae Tapia. 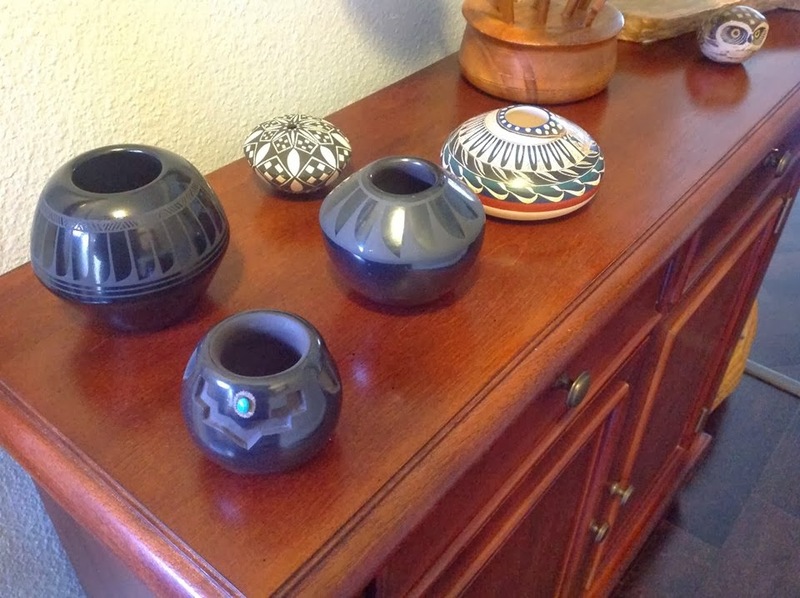 The small black and white "seed jar" is the very early work of the premier potter Robert Patricio, Acoma, NM. The pot with the lovely colors is "Moving to Mesa" by Mountain Ute artist Norman Lansing. My dining room table is piled with linens. during her Asian travels. I had previously inherited some of those she gave to her mother. 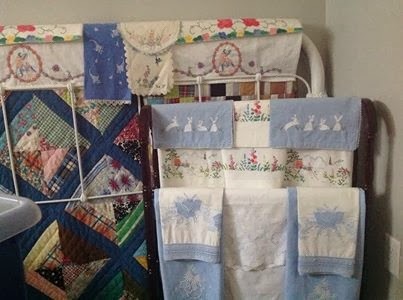 I love linens and have a number displayed in our guest bedroom. 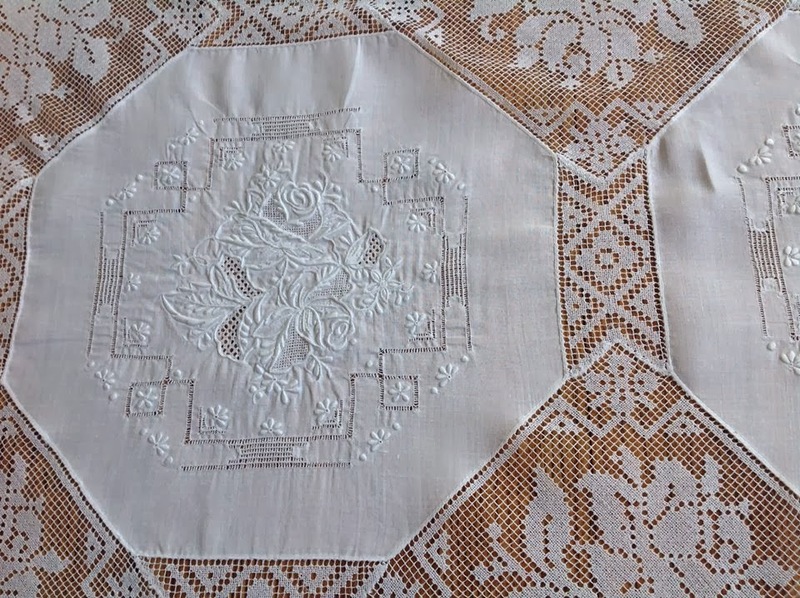 I have been enchanted by the table linens and have spent a week working on stains in a beautiful white on white embroidered panels and lace tablecloth. Finally succeeded. Cold water always. Finally, the last resort: a long soak in dishwasher detergent, Cascade. The stain is gone. Now to iron. I seriously need to weed my collection of table linens and storing all these old/new additions will be an incentive, I hope. Some things from Betty's house fit perfectly in mine. Some things will be a perfect fit soon: the Asian brass candlesticks that Charles had converted into lamps--need to be rewired and something done about the shades--are going to look great in our dining room. Some things are a bit more problematic like trains sets and bright red "sandbox" toys. Not to mention the books.